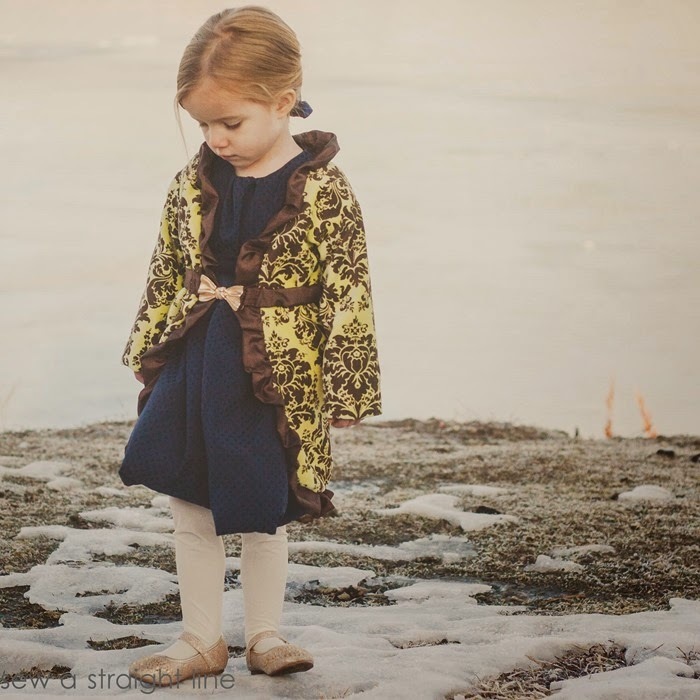 Today Sabra is sharing her modified Ruffled Cardigan – and I LOVE how she changed it up! 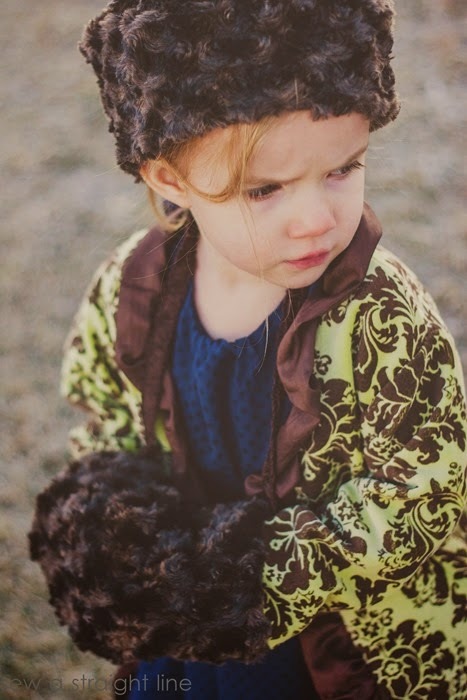 Plus, she’s got a FREE pattern and tutorial for the accessories she made her daughter, so make sure to read the whole post to find that. 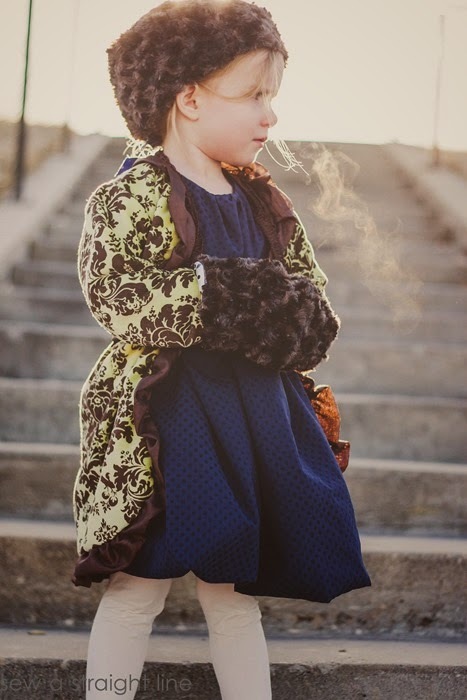 Hello, this is Sabra from Sew a Straight Line sharing my daughter’s fancy new dress coat, made using Blank Slate Pattern’s Ruffled Cardigan. I’ve been wanting to make Ivy a dress coat for a while now. 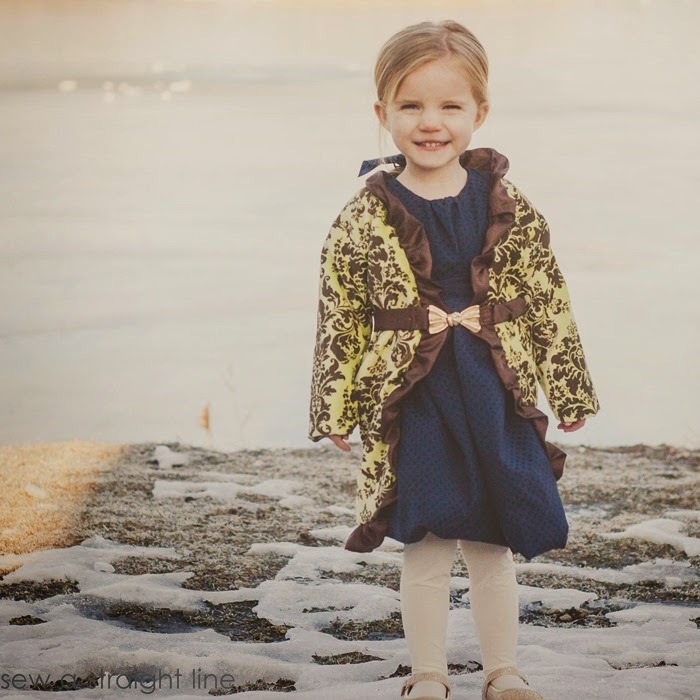 Fully lined, with just the right amount of girly details, I only had to make a couple very minor, and very easy changes to the Ruffled Cardigan pattern to take it from an adorable layering piece to beautiful, functional outwear. 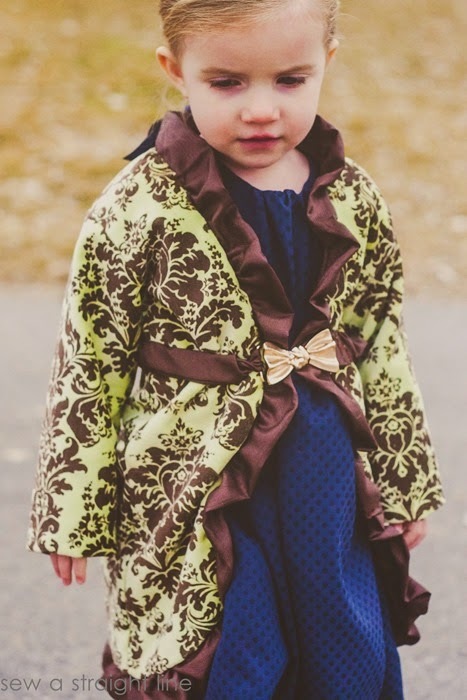 Though it’s a fairly easy sew, the all-around ruffles and the belt make the Ruffled Cardigan (or coat!) sweet and interesting from every angle. The cardigan is fully lined, which I love. There are no exposed seams inside or out, which makes things look so professional and polished inside and out. Also, it allows for you to make the cardigan reversible really easily, if you wanted. The pattern calls for knit fabrics, but I used wovens. I went up a size for my daughter to accommodate for the fabric change, and the fit is great. The fabrics I used are a fabulous velvet damaske print from Moda paired with a poly from Jo-Ann Stores for the lining, ruffles and belt. 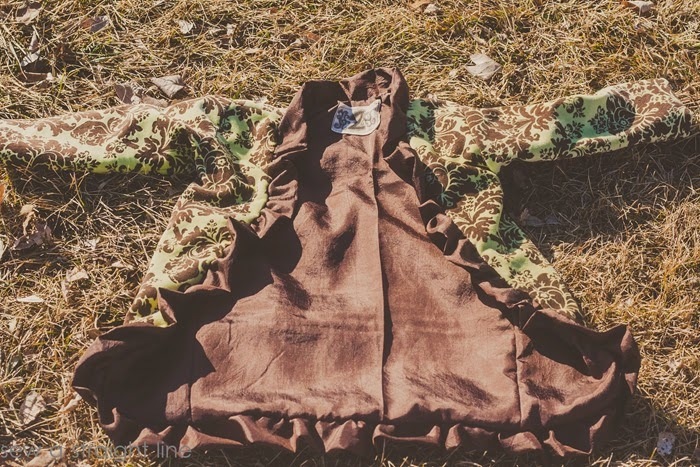 The pattern is so easy to sew, with a sweet little belt closure. 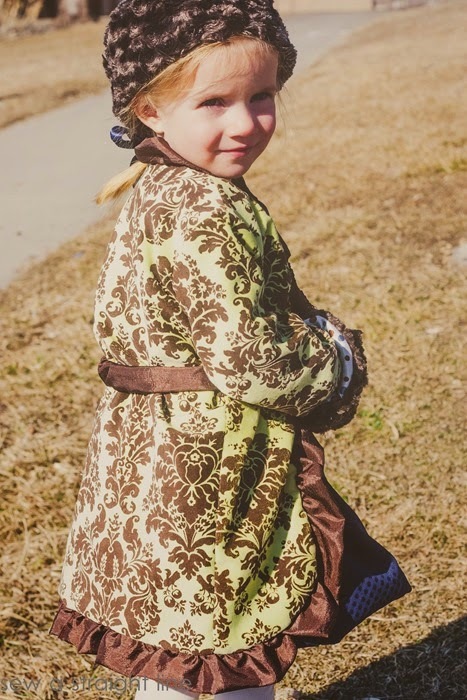 I did the belt just a bit different than the pattern suggested, and I also lengthened the cardigan to make a dress coat for my three year old. 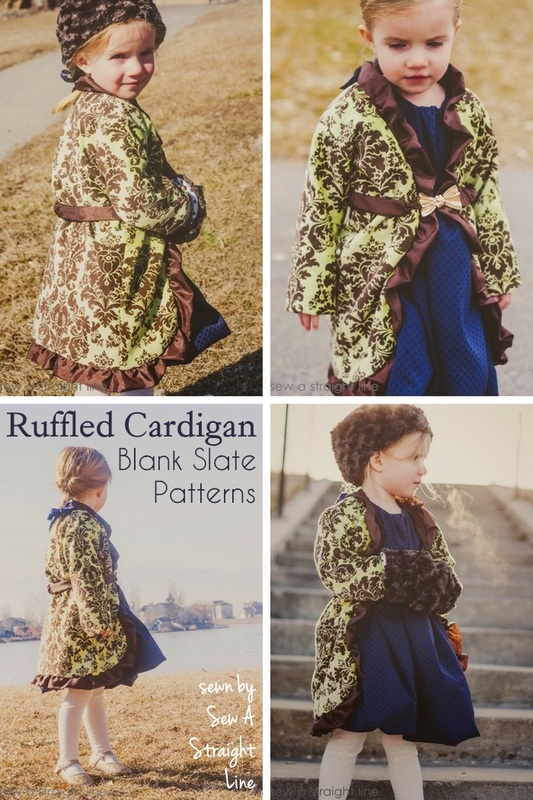 Lengthening the Ruffled Cardigan is simple. I cut the front pattern piece right at the stretch direction arrow printed on the pattern. 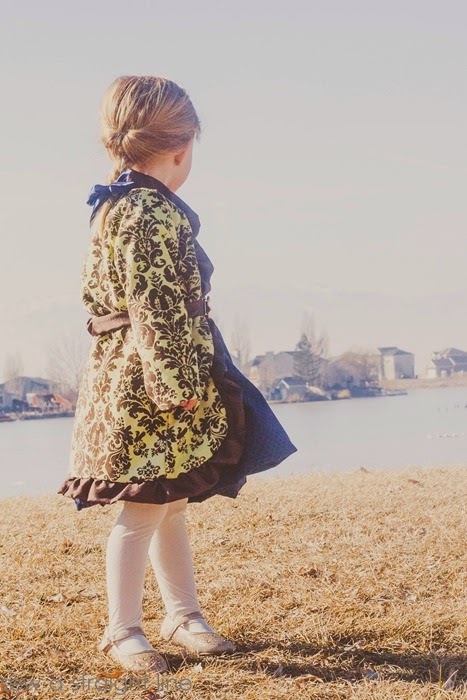 I measured my daughter from top of shoulder to just below the knee, because I wanted the coat to hit right at her knee and needed to add a bit for seam allowance. Then I used that measurement to know where to place the two halves of the front pattern piece on the fabric, using a ruler to make sure the straight edges were lined up. After cutting out the front piece, I used that cut piece to help me cut out the back of the jacket. Then cut the lining from the cut front and back pieces. 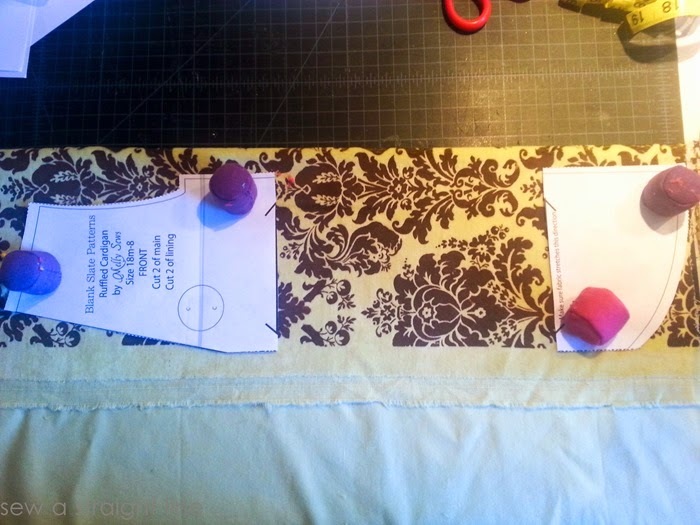 The rest of the sewing was according to the pattern directions, mostly, and so quick. I did do the lining just a bit differently, since I didn’t want stitch lines at the cuffs. And then I did the belt slightly different, too. The pattern calls for a simple ribbon belt, that you tie in the front. Ivy had found this metal bow closure at the fabric shop, though, and as soon as I saw it, I knew it would be darling with this jacket. So I made a tube from the lining/ruffles fabric, threaded some elastic through the tube, sewed it off at both ends, and added the bow buckle closure. Same basic idea as the pattern’s ribbon belt, but a bit more fancy and fun.